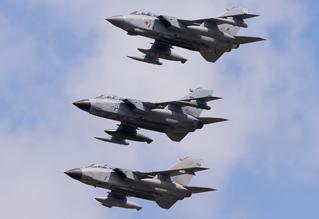 Held over the weekend of 17th to 19th July 2015, this year’s Royal International Air Tattoo followed on the heels of a 2014 show that was criticised for the reduced number of static aircraft but praised for fixing many issues from 2013. In a year where for the first time the UK lacked any other truly major military two-day airshow, all eyes turned to RAF Fairford to deliver the goods. How did they do? Andy Evans reports from the FRIAT enclosure. 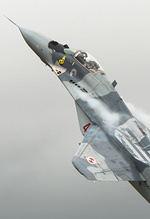 Photography by the UK Airshow Review team. The build up to this year's RIAT was for many a white knuckle ride of participation announcements being over-hyped by certain online communities which then proceeded to level unjustified criticism on Douglas Bader House (DBH) when those expectations weren't met. However, slowly but surely a strong line-up of flying and static participants began to appear. Whilst the list of flying acts was strong varying from fast jets to transports to set piece formations many however complained there were not enough afterburner acts. 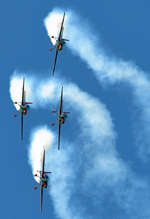 That of course is a subjective view however unusually for RIAT as time went on there was no hint at a key star emerging that would attract enthusiasts in their droves. Time passed and the Saturday sold out, and true to form RIAT announced not just one star but a pair in the shape of two Kawasaki P-1s of the Japanese Maritime Self Defence Force (JMSDF) - which would feature in both the flying and static displays. The appearance of the P-1 not only provided the enthusiast with a real star item but also represented a key point in history - no pilot or aircraft from the JMSDF had appeared in UK airspace since 1927 and as part of the deployment it marked the first time any JMSDF aircraft had ever traversed the Atlantic Ocean. The excitement surrounding this deployment was justifiable and represented a major coup for RIAT. 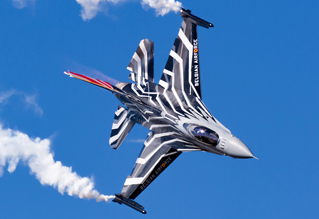 Of course, the P-1 was not the only aircraft debuting at this year's show with the flying also hosting the UK debut of the Greek F-16C demo team 'Zeus', USAF CV-22 Osprey and the French Mirage 2000N duo 'Ramex Delta'. 'Zeus' in particular made a welcome effort to attend considering all the economical strife their homeland has experienced of late; even painting their display aircraft in a special scheme specifically for the show. Not to be outdone internationally, our own RAF took RIAT as the opportunity to debut their new Hawk T2 pairs role demo, whom we have recently interviewed. The flying line up was strong and many acts performed superb displays - each with their own unique selling point, resulting in too many acts for us to discuss individually. 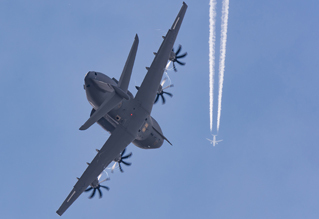 Some of mention: the Polish MiG-29 left you wanting more with its Lightning-esque take off; the Airbus A400M performed in a manner that defied its bulk; the Belgian F-16 was also much improved over previous years and the Finnish Hornet wowed with its square loop. The new Hawk duo certainly has potential to become a decent display, however needs much work. As right now the aircraft spend a little too much time away from the crowd repositioning. However, special mention must be given to two flying acts that stood head and shoulders above the rest; the Vulcan and Ramex Delta. 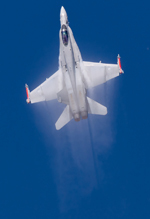 In reality we only saw a full display from Ramex on the Saturday due to a "practice" on the Friday. However this display gave everyone a taste of why the continent loves them with precision and power being exhibited throughout the display - but it was on Sunday when their absolute professionalism shone through. Shortly after take-off one aircraft suffered a fly-by-wire issue necessitating an emergency landing. This would normally result in a cancelled performance however the remaining aircraft proceeded to fly the display as a singleton which thoroughly deserved the spectators' respect. Of course, it is well known that Avro Vulcan XH558 is in its final flying year and therefore after last year's trouble it was only fitting that RIAT marked its passing with a special event. Typically this appearance would be remembered for the special flypasts performed with the Red Arrows - or, at least, that was what DBH planned until it was completely overshadowed. 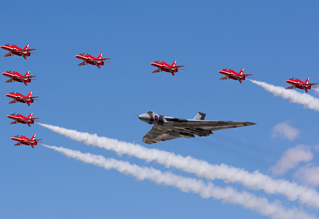 RIAT's farewell to the Vulcan will be remembered for the Saturday display by Kev Rumens. 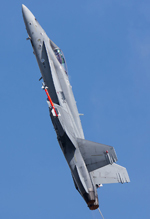 In a routine that left even the most hardened critics with their jaw on the floor, Kev proceeded to perform a tight, almost knife-edge, turn on take-off before performing a fast, powerful, energetic display which ended with an aggressive, almost vertical, zoom climb and virtually inverted wingover at the end. It was the display that should have been the norm since 2008. It is just a pity that this wasn't repeated on the Sunday when the display was flown by Bill Ramsey. We understand that Kev was not penalised by the Flying Control Committee for the content of his Saturday display and therefore the only reason the Sunday routine was poorer was down to the pilot. Perhaps Kev should have been permitted to fly the display both days? Even with the strength of the line-up, it was disappointing that not everything in the flying smelt of roses. 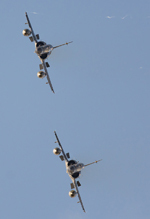 Rearing its ugly head following a welcome banishment in 2014; touch and goes as part of fast jet displays were once again reduced to gear down flypasts - ruining this superb dynamic element. It also appeared that the vast majority of acts were further away and higher than in 2014 (in particular Zeus which was a dot for much of its display). After the criticism that the MAA (and DBH by association) received in 2013 and the praise in 2014 when these two aspects of the display were reinstated, we just cannot understand this flip flop in regulations - we would very much welcome news that the MAA has seen common sense and reinstated the 2014 rules rather than further eroding the great British airshow. We can but dream. 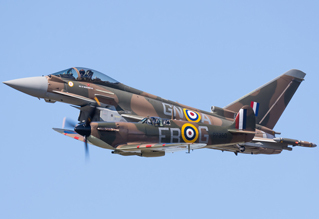 Two of the key points in the 2015 flying display were the anticipated commemorations for both the long-since disbanded Tri-National Tornado Training Establishment, and more significantly, the Battle of Britain. Despite slightly dubious credentials, the TTTE were celebrated both in the air and on the ground. Consisting of two flypasts and a break to land at different speeds and angles of wing sweep, these passes were all straight and level, and the period of time between each was more akin to turning round a lumbering beast like the B-52 rather than agile fast jets. Nothing like the TTTE displays of old, and something of a missed opportunity as a result. 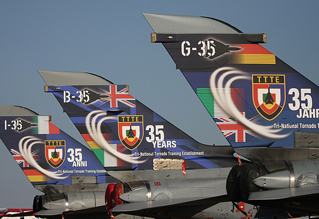 Whilst the aerial tribute was drawn-out and of questionable value besides the chance to see three Tornados powering into the air, the trio in the static park were handled altogether better, each adorned with a vinyl tail wrap to celebrate the 35th anniversary of the formation of the unit and, as none of them were sealed or cleared for flight, a RIAT ticket was the only way to see these fleeting markings. Similarly, whilst it was great to see the Battle of Britain commemoration with up to 18 warbirds in the air, this also lacked that winning aspect. Certain aircraft including the Blenheim and Bf-109G were under-utilised as filler displays whilst the formation positioned itself - these key types should have joined the rest of the balbo formation which itself could have been much tighter to improve the spectacle. The flypast was also straight and level - the inclusion of a dedication topside pass would have been very poignant - again a missed opportunity. It was pleasing to see that last year's concerns regarding the static display had been addressed. The return of the USAF in significant numbers was more than welcome, and the number of larger aircraft types certainly improved the impact of the static on the public - perhaps helped by the very welcome location of most of the flying fast jets to the west. Whilst the positioning of some aircraft was questionable we do understand that sometimes this is hard to get every aircraft perfectly positioned; however, the Friday "Pit Day" opening was a disappointment to some with the area opening and closing throughout the day, perhaps clearer details of timings should be given in advance if the operation continues next year. It was also excellent to see the removal of the funfair, something we have always thought was pointless at an airshow. We just hope that the new Autodrome doesn't expand further. This is after all RIAT, not Goodwood. Another welcome aspect was the increase in crews having stands; allowing visitors to get up close and personal with their idols. With the increased recent popularity for the collection of higher value items such as Challenge Coins it was also nice to see crews embracing this and more becoming available for sale to the general public. 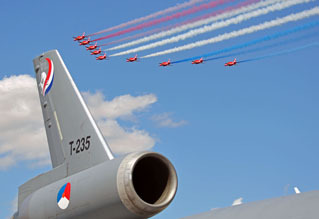 RIAT 2015 was the first under the control of Andy Armstrong and based on the strength of the flying, static and ticket sales it is a safe assumption to state the event was a resounding success. The event has gone from strength to strength since the low point of 2013 and this is something the organisers should be congratulated on. However with any event, fixing one issue can often result in the inadvertent creation of new issues. This year for the general public we are only aware of two such issues that have been reported to us. After the flying display ends, the showground is advertised to be open until 7.30pm - therefore many take this as the opportunity to walk the static, by now devoid of crowds. This year the Air Tattoo Crew plus other officials at around 7pm began, quite aggressively, telling people to leave. The airfield closes at 7.30pm not 7pm and this represents a concerning trend. We have to consider whether the post show staff parties have now reached a scale whereby they take precedence over the public's access to the show during opening times? We sincerely hope not, given that those at the receiving end are paying customers. Secondly, members of the public have flagged up to us the on-the-day cost of attending arrivals or departures outside of the FRIAT packages. These charges can only be described with one word - extortionate. In order to attend this year's departures day without an advanced ticket would have set you back £26 per person. This amount is far in excess of the on-the-gate charge of the majority of British airshows on a show day; let alone a departures day. What we cannot fathom is why people will pay this charge? Until people vote with their wallets and feet by visiting, say, Rhymes Farm on departures days then RIAT will continue to charge well above the odds. Hopefully DBH will realise how high these prices are and do something to help alleviate this - perhaps by holding the charge for five years or even reducing it? 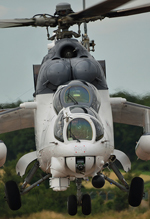 We turn our thoughts to the FRIAT packages which are advertised as being the premier way to experience RIAT. 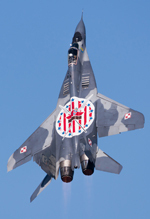 Whilst we agree that this is still the case, based on the events of this year and the early 2016 renewal price for Mach 3 of £210 we must say for perhaps the first time ever in our reviews - FRIAT is now poor value for money; particularly Mach 3 which we believe is a knock on effect of the Friday becoming a show day. Advertised as a six-day package running from Wednesday to Monday, with enclosure access on each day except Wednesday, there is a valid inferred expectation that the Mach 3 member will see all the action except for the occasional Tuesday early arrival. Indeed, one of the prior straplines of FRIAT was that members got to see 'the first arrival to the last departure' or words to that effect - when did this change? This year, Wednesday was, for want of a better word, dead - with very few scheduled movements, it felt that visitors spent more time napping than watching aircraft. Conversely, it soon became apparent on Thursday that the afternoon's movements carried on until between 7.30 and 8pm which excited many. It was therefore annoying for FRIAT members to be instructed to leave the enclosure by 5pm sharp with 2.5 to 3 hours of flying still remaining - based on the movements sheet at least 25% of the days movements remained. There was the option to divert to Park and View - however not only does this assume all FRIAT members have access to a car (with no provision of a shuttle bus, a 40 minute walk in both directions is necessitated) - these areas were naturally busy and wouldn't give the view allowed from FRIAT - at the end of the day, we pay for access to the enclosure above all else, especially when the lion's share of remaining movements were display practices. After querying this decision, we understand that from 5pm until 7pm on Thursdays is now designated as the validation period and DBH have declared that no public must be on site during this period. Not only does this seem hypocritical when Park and View remains open and some validations occurred during a full public day on the Friday, it is also completely unacceptable to FRIAT members who pay hundreds of pounds to be present for arrivals and practices. This is something that must change as a matter of urgency if FRIAT is going to continue to be good value. The author would welcome a discussion with DBH over how this may be overcome and looks forward to hearing their proposals at the next FRIAT forum. The issues with FRIAT, display distance, set piece and overzealous ground staff aside, we must reiterate that this year's show has been a resounding success. The mix on the ground and in the air was excellent and we are yet to hear of anyone within the showground that didn't enjoy themselves. It may seem picky to highlight faults at such a successful show - however, if no-one does then how are those who work at DBH meant to improve the show, a show that all British aviation enthusiasts love and care for. RIAT 2016 takes place over the weekend of 8th to 10th July 2016 and being as it is the weekend before Farnborough we would be surprised if we didn't see at least one stealthy participant. In all honesty however, if the show follows the same successful format as this year but with the few snags rectified, it will be a winner. See you all next year!